I lie down in a mirrorless, windowless room, pulsing with red light like a Nevada sunset. Throbbing sounds hum low in the background, my limbs ache gently, and my brain is fast slipping into some kind of trance. I’m at Chroma Yoga in Shoreditch, London, and I’m winding down a yoga practice that’s unlike any other I’ve experienced before. This is ‘immersive’ yoga, and it’s at the apex of a huge new trend. From Hatha to Bikram, yogis have always had a plethora of styles to choose from. But nowadays, flex-loving Londoners can try everything from Voga (sass and disco pants essential) to Stand Up Paddleboard yoga. 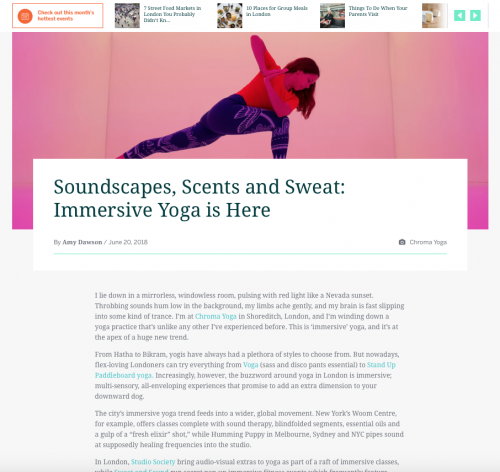 Increasingly, however, the buzzword around yoga in London is immersive; multi-sensory, all-enveloping experiences that promise to add an extra dimension to your downward dog. The city’s immersive yoga trend feeds into a wider, global movement. New York’s Woom Centre, for example, offers classes complete with sound therapy, blindfolded segments, essential oils and a gulp of a “fresh elixir” shot,” while Humming Puppy in Melbourne, Sydney and NYC pipes sound at supposedly healing frequencies into the studio. In London, Studio Society bring audio-visual extras to yoga as part of a raft of immersive classes, while Sweat and Sound run secret pop-up immersive fitness events which frequently feature yoga. But it’s at Chroma Yoga, founded by art director and creative consultant Nina Ryner (a former hype girl for the DJ and producer Totally Enormous Extinct Dinosaurs) where the immersive trend really hits the next level. Classes are organised by colour – red, blue, pink, orange or yellow – and use the principles of light therapy to affect our mind and bodies in ways that go way beyond the aesthetic. For example, the blue sessions are intended to combat Seasonal Affective Disorder and energy slumps, but don’t take place any later than lunchtime; because blue light is known to hinder the production of melatonin, the hormone that lets our brain know it’s time for bed. The immersive workout trend, pioneered by the likes of Les Mills, has been gathering pace for a while now. But it’s perhaps with yoga that it feels most to the point. While all you ever really need to learn yoga is a mat (and perhaps a sense of humour), there’s no doubt that these kind of multi-sensory experiences can make it a little bit easier to feel present in the moment. Yoga, after all, isn’t really about bending your body in impressive ways; it’s about using movement and breath to achieve (hopefully) a spot of inner clarity. While gongs, bells and chimes have been used as multi-sensory mind clarifiers, in conjunction with yoga, for thousands of years, there’s no doubt that modern advances in technology are driving the new generation of immersive yoga classes. “From a prosaic point of view, this technology is becoming easier and cheaper to manufacture,” says Charlotte Cox, a former corporate lawyer who has just launched immersive yoga studio FLY LDN. Classes there take place in front of a huge screen projecting vivid videos of nature, space and colour, to a background of calming music. “A few years ago it could be prohibitively expensive, but now as things are getting easier I think we’ll see more and more people get into it.” Moreover, millennials are spending more time and money than any generation before on wellness. Immersive yoga sessions stand out from the crowd in a competitive, over-crowded London wellness scene. Of course there are alternative cheap, natural and lovely ways to give ourselves a ‘multi-sensory’ wellness experience that will make us feel amazing; a swim in the cold, salty sea, for example, or a walk through a fragrant forest. But the reality is that such treats are off the daily timetable for most of us, so we’re reaching for specially curated happenings instead. The future of city fitness? It might just be immersive.